Enjoy fall harvest in this unique Fig Pear and Apple Crisp. Fresh fall fruits with nutmeg and clove spices. Covered with a crumbly, golden almond and oat crisp topping. Fig, pear and apples? (plus there’s dried cranberries too!) 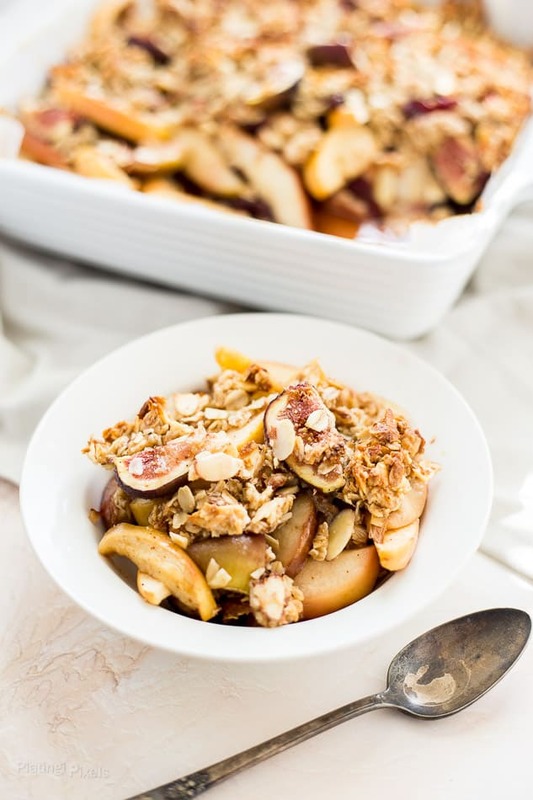 This Fig Pear and Apple Crisp was my first attempt at combining as many of my favorite fall ingredients as I could, and it was a surprising success. This oatmeal crisp recipe is a simple way to enjoy fall flavors in a unique and healthy breakfast. 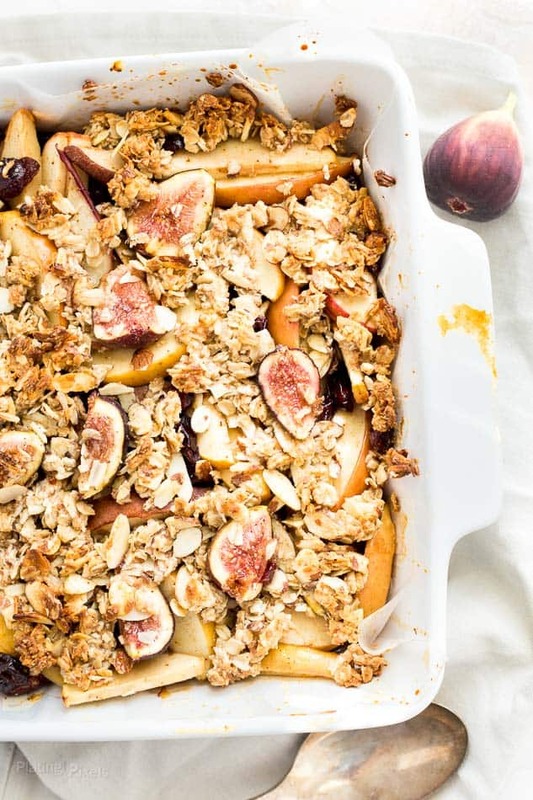 This Fig Pear and Apple Crisp is about as all about Autumn. Ground nutmeg and clove are added for extra holiday spice. It’s also super simple. Thinly slice the apples and pear, and quarter fresh figs. 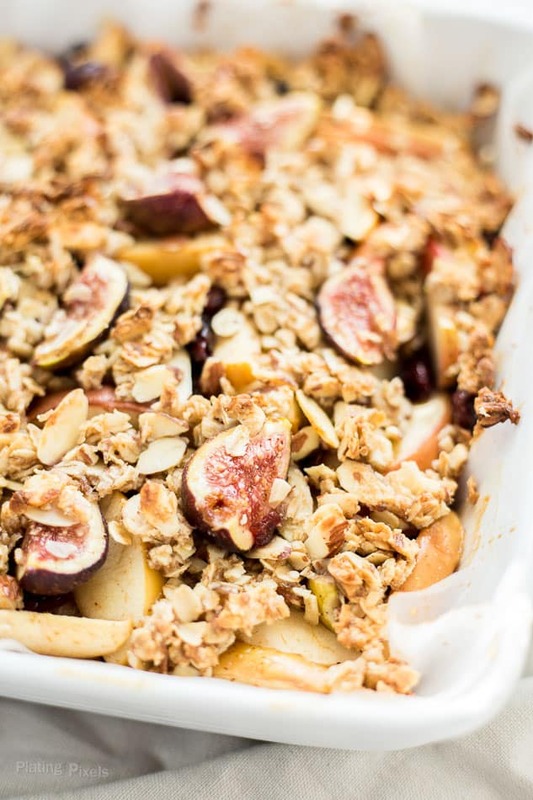 Top with the almond and oatmeal crisp crumble then bake until tender and crisp golden brown. For additional sweetness beyond what’s in the fruit I added honey. No additional sugar is needed in this apple crisp thanks to the sweet flavor. 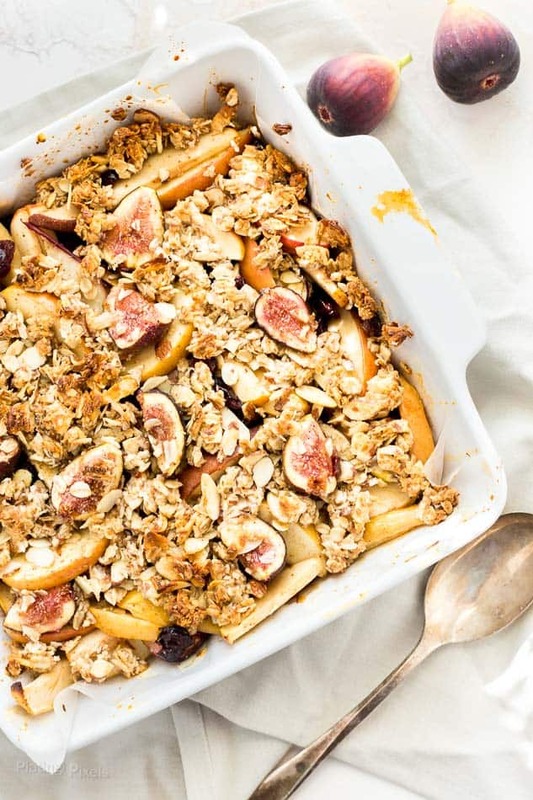 Whether you’re fully in fall baking mode, or looking for recipe inspiration, this Fall Harvest Fig Pear and Apple Crisp is sure to impress. It’s loaded with fiber and nutrients from fresh fall fruits, plus protein, healthy fats and complex carbs of almonds and rolled oats. A perfect way to enjoy a sweet breakfast or healthy dessert. Flavor profiles: Sweet and fruity fall flavors of apple, pear, fig and cranberry with holiday spices. Texture: Tender fruit bottom with a crisp and crumbly topping. Fresh fall fruits with nutmeg and clove spices. Covered with a crumbly, golden almond and oat crisp topping. Preheat oven to 375° F. Thinly slice apples and pears and place in a large bowl. Stir in figs, dried cranberries, nutmeg, clove and 3-tablespoons honey until evenly coated. Place in a parchment-lined or greased 9x9 square baking dish. In a medium bowl stir together oats, almonds, flour and salt. Stir in remaining 3-tablespoons honey. Add butter and use a pastry blender to cut into mixture. It should be combined, but crumbly with small clumps. Sprinkle over fruit mixture. Bake 35 minutes, or until fruit is tender and topping is crisp and golden brown. Be sure apples and pears are ripe and smell sweet. 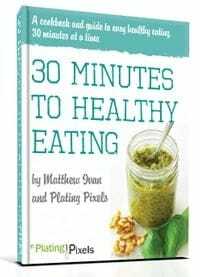 This is the main flavor of this recipe and will affect the results greatly. This looks like the perfect crisp for fall. I bet the figs taste amazing! Absolutely gorgeous crisp! Love the use of fall fruits and flavors and that topping looks incredible. Oh this looks incredible and I just bought a box of apples and pears. This post was just in time! Okay, I’m super excited to find this post! My husband bought a GIANT box of figs and I have never once cooked/used them! This crisp recipe would be perfect, thanks! Nice dessert. I love this very healthy, tasty combo of oats and Fall Fruits. Such a gorgeous crisp -Being on Spelnda’s 30 day no sugar challenge, I so love that it’s refined sugar free!